In addition to ‘The Lookout’ featured in the previous post, August brought many other exciting new changes to the lodge. We have a few photos of the lookout floor installation process here along with a whole bunch of other gems mined from our photo collection. As you will see, we have been keeping pretty busy…. 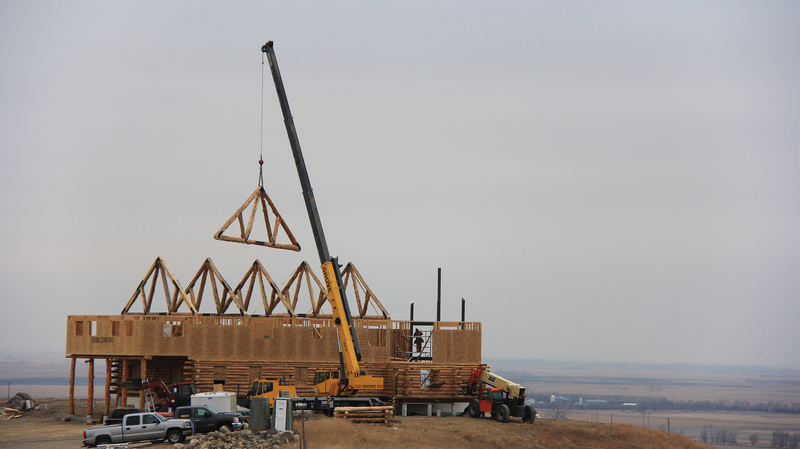 As the weather warmed up this summer, construction really started moving along at the lodge! Here are some highlights from June and July at Coteau des Prairies Lodge. Click on an image below to open the photo gallery. If you like these photos you will enjoy our latest Facebook construction album, an ongoing collection. It is especially fun if you enjoy vintage photos. Click here to check it out. And while you are there, don’t forget to ‘like’ us! Coteau des Prairies Lodge is truly a one-of-a-kind getaway experience. Perched on the northernmost ridge of the Coteau des Prairies, where the breathtaking view is second to none, prairie farms and fields unfold from below like a patchwork quilt. You will find yourself at home at our rustic, yet refined lodge, constructed with native North Dakota pine. With custom log and steel architecture, you will be awed at every turn, from our magnificent great room to our signature lookout. In the pasture surrounding the lodge, where our cattle graze, you will find a new kind of relaxing vacation. Created and operated by a farming family, the lodge atmosphere embodies the legacy of the multi-generational farms from our area. From our warm country welcome and hearty homemade meals to our outdoor expeditions and hands-on farming fun, your rural experience comes alive! With 13 bedrooms, large open spaces and plenty to do, there is something here for everyone. Enter your email address to subscribe to our blog and receive notifications of events, promotions, giveaways and more! For a limited time, receive a FREE Lodge Mug coupon when you subscribe. *You must activate your subscription through the email sent to you, which may go to your junk mail.